A former wife of veteran actor, Segun Arinze has married her third husband. The woman, who also is an actress, Anne Njemanze, well known as Domitila, a name she picked from a movie with the same title some years ago, hooked her third hubby yesterday. Anne was one of the favourite stars in the 90's, she married the talented actor back then, but their union crashed like a pack of badly arranged cards. 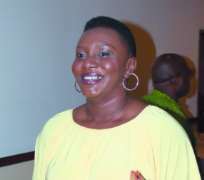 Information reaching Nollywoodgists.com now shows that Anne married one Uzodinma Amadi, which was reportedly witnessed by associates of the new couple.